19 November 1600: Prince Charles, the second son of King James VI of Scotland and his wife Anne of Denmark born at Dunfermline, Fife. 24 March 1603: Queen Elizabeth I dies. Robert Carey rides to Edinburgh to tell King James VI of Scotland that he is now King James I of England. 16 April 1603: King James arrives in York on his way from Edinburgh to London. He is given the keys to the city. York affected by plague. 3, 500 people die. 31 January 1606: Gunpowder Plot conspirators executed. November 1612: Prince Henry, the Prince of Wales falls ill with typhoid and dies. King James is paid £300,000 by a Londoner called Cockayne for the monopoly on dying and finishing cloth for export. Clothiers of the West Riding have to send their wares to London to be finished. Even worse the finished goods are so bad that buyers refuse to purchase English cloth damaging the reputation that the West Riding clothiers had been building. James eventually rescinds the grant. 25th September. Lady Arbella Stuart dies after a five year imprisonment in the Tower. She is buried in Westminster Abbey with Mary Queen of Scots. King James revisits York on his way to Scotland. Plague in the clothing towns of Leeds and Halifax. 1627 The Duke of Buckingham leads a force of 8,000 men to La Rochelle to relieve the Huguenots. Only 3,000 return. 1629 King Charles I dismisses parliament and begins the years known as ‘personal rule’. Plague in the clothing towns of Leeds and Halifax. Five years since last outbreak. Laud appointed Archbishop of Canterbury. May 1633: King Charles I visits York during his journey to his Scottish coronation. February William Prynne sentenced to have his ears cropped. William Pickering fined £5000 and sentenced to have his tongue pierced with an awl for accusing Protestants of being heretics and devils. John Lambert marries Frances Lister the daughter of Sir William Lister. He will go on to enlist in his cousin, Lord Fairfax’s, regiment and become a very distinguished Parliamentarian general. 30 March 1639: King Charles I visits York. King Charles I is forced to summon Parliament. He returns to York on his way to make war against the Scots who have rejected Archbishop Laud’s prayer book. 5 May 1641: John Pym reveals the so-called Army Plot. Henrietta-Maria and five other members of the court are caught in the conspiracy. 8 May 1641: Parliament passes Bill of Attainder against the Earl of Stafford. 10 May 1641: Charles signs the bill against the Earl of Stafford. 17 November 1641: Parliament orders a Day of Fasting. 1 December 1641: The Grand Remonstration listing grievances against Charles I passes through Parliament by a small majority. The queen is told to dismiss all her catholic priests. A priest called Goodman is condemned to death but reprieved by Charles at the request of Henrietta Maria. Leeds was granted the right to a mayor. It’s council was largely composed of clothiers. 1 January 1642: Charles I offers John Pym the Chancellorship which he declines. 3 January 1642: Charles I decides to arrest the five MPs he held responsible for the Grand Remonstration including John Pym and John Hampden. 4 January 1642: Attempted arrest of 5 MPs. They receive warning and are able to flee before the king arrives. 5 January 1642: Charles goes to the Guildhall to demand that the five MPs he wants to arrest are handed over. On his way back to Whitehall the London crowd surround his coach. 7 January 1642: Trained bands of London men moved from the control of the Lord Mayor into the hands of a joint committee of aldermen and MPs. 10 January 1642: Charles I and his family leave Whitehall for Hampton Court. 13 January 1642: From Hampton Court the royal family goes to Windsor. 23 February 1642: Charles I is in Dover to see his daughter Princess Mary safely aboard the Lion to take her to the Low Countries to be with her husband William of Orange. Queen Henrietta Maria goes with her to see her safely settled into her new home and to sell the crown jewels to raise funds for Charles. March 1642: Charles goes to York sets up a printing press and a mint. Parliament sent a committee to York as well. 22nd April 1642: The James, Duke of York and Charles Louis (Charles’ nephew) visited Hull and were made very welcome by the governor of the city Sir John Hotham. 23rd April 1642: Charles I arrives at the gates of Hull but the governor Sir John Hotham refuses to admit him. 12th May 1642: Charles summons a meeting of the Yorkshire gentry. 27 May 1642: Parliament claimed sovereignity based on the fact that it believed the king was making an illegal war upon them. 3 June 1642: Charles summons a second meeting of the gentry on Heworth Moor. He wanted to secure their assistance but was met by opposition represented by Thomas Fairfax who gave the king a petition requesting that Charles make terms with parliament and thus avoid war. Charles refused to accept the petition. 9 July 1642: Parliament raises a 10,000 men volunteer army. 12 July 1642: The Earl of Essex given command of Parliament’s army. July 1642: Charles makes an attempt on Hull but Parliament arranged for Hotham to be supported by someone sent by Parliament. The King is turned back for the second time. 15 July 1642: Lord Strange and Royalist troops forced from Manchester. 4 August 1642: Sir Ralph Hopton kills twenty-seven parliamentarians near Shepton Mallet. 16 August 1642: Charles leaves York. 20 August 1642: Prince Rupert of the Rhine and his brother Maurice finally land at Newcastle. They bring with them men, munitions and arms sent by Henrietta Maria. 22 August 1642: Charles raises the royal standard in Nottingham and declares Parliament to be traitors. The first civil war 1642 – 1647. September 1642: Essex’s army assembles in Northampton. 14 September 1642: Parliamentary army in Coventry. It moves from here to Worcester. In the meantime the Royalist army marches from Nottingham to Stafford and then on to Shrewsbury. 23 September 1642: The Battle of Powick Bridge. One hundred and fifty men are killed in the vicinity of Brickfield Meadow. 12 October 1642: The King heads from Shrewsbury via Bridgenorth, Kennilworth and Banbury in the direction of London. 23 October 1642: The Battle of Edgehill. Charles does not make the most of his opportunity to retake London. 26 October 1642: The King is at Banbury. He then moves to Oxford. 6 November 1642: The Royalists arrive in Reading. 11 November 1642: Prince Rupert told to take the town of Brentford. 12 November 1642: Rupert takes and sacks the town. 13 November 1642: The Battle of Turnham Green ( more a skirmish than a battle). December 1642 : Thomas Fairfax stays in Selby. The town is provided with defences. 2 February 1643: Henrietta Maria sets sail from the Low Countries but bad weather forces her to turn back. 22 February 1643: Henrietta Maria sets sail from the Low Countries once more. She makes land at Bridlington and stays overnight in a cottage. In the morning her vessels and the harbour are fired on by Parliamentarian ships. 21 April 1643: The Siege of Lichfield concludes with the town falling to Prince Rupert. 24 May 1643: Fairfax breaks out of Leeds. He makes a surprise attack on the Royalists in Wakefield. 4 June 1643: Henrietta Maria leaves York accompanied by 4,500 men. Her visit to Yorkshire has led Sir Hugh Cholmley to declare for the King – he is the governor of Scarborough and Whitby. 18 June 1643: Henrietta Maria arrives in Newark. 30 June 1643: The Battle of Adwalton. Royalist victory for the Earl of Newcastle. 3 July 1643: Ferdinando Fairfax and his son Thomas Fairfax flee Bradford for Hull. 4 July 1643: Sir Francis Mackworth takes Halifax for the Royalists. Phoebe Lister buries the deeds to Shibden Hall,Halifax and flees to Lancashire. 13 July 1643: The Battle of Roundway Down (Devizes). Henrietta Maria arrives at Wroxton where she is reunited with Charles I. 14 July 1643: Charles I and Henrietta Maria arrive in Woodstock. 2 September 1643: Hull besieged. 7 September 1643: Charles forced to lift the Siege of Gloucester. 20 September 1643: The Battle of Newbury. Parliament victorious. 25 September 1643: Parliament agrees to the Solemn League and Covenant which brings Scotland into the war on Parliament’s side. 12 October 1643: Siege of Hull raised when Lord Fairfax takes the Earl of Newcastle’s artillery. Cromwell wins the Battle of Winceby for Parliament. 21 October 1643: Colonel Bradshaw takes Heptonstall for Parliament and occupies Sowerby for two days. 1 November 1643: The Battle of Heptonstall – Royalist troops gather at Hebden Bridge but are beaten back by musket fire and a fall of rocks. 1643 Royalist troops use Selby Abbey as a stable. 1 January 1644: The Scots invade England with an army of 20,000 and weaken Charles’ hold on the North. 4th January 1644: Battle of Sowerby Bridge. Royalists victorious but when they arrive at Heptonstall they find it deserted. The Royalists are garrisoned at Keithley. They fire Heptonstall and then set out for home via Haworth which they also fire. 11 April 1644: Sir John Bellasis, Governor of York, intercepts a letter from the Fairfaxes containing a plan to march north so that they can attack Newcastle from the rear while he attempts to stop the Scots marching south. Bellasis, marches out of York and surprises the Fairfaxes at Selby. The York Royalists are defeated and Bellasis is captured. 16th April 1644: The Marquis of Newcastle is near Durham so marches south to save York from the Parliamentarians. 22 April 1644: 28,000 Parliamentarians- English and Scots- lay siege to York. 17 April 1644: Queen Henrietta Maria is pregnant. She leaves Oxford for Abingdon with the king and her sons. 18 April 1644: Henrietta Maria says farewell to her husband. She will never see him again. 4 June 1644: The Parliamentarian Eastern Association Army commanded by the Earl of Manchester arrive at York to support the seige. 16 June 1644: Parliamentarian mine is below York city walls is blown up. St Mary’s Tower falls while the Royalists are in church. 600 men under the direction of Laurence Crawford enter the breach but the Royalists counter-attack and drive them back. 300 of Crawford’s men die in the attempt. 29 June 1644: The Battle of Cropredy Bridge. 30 June 1644: Prince Rupert arrives at Knaresborourgh. The Parliamentarian armies lift their siege. 1 July 1644: Parliamentarian army drawn up in battle order near the village of Long Marston. Rupert did not advance as expected and by the evening has arrived at York but does not enter the city. He asks the Marquis of Newcastle to join him in attacking the parliamentarian army but they do not emerge from the city to join him by 6 a.m..
2 July 1644: Rupert meets the Parliamentarians at Marston Moor and gives battle but it is too late to make use of their tactical advantage by the time Newcastle arrives at 9 a.m. and his army several hours later. (4p.m. by the time they take up positions). 7 p.m. battle commences after Rupert has gone to dinner believing that there will be no battle that night. During the battle Rupert’s poodle ‘Boy’ is killed. The Marquis of Newcastle takes ship from Scarborough and does not return to England until the restoration of Charles II. July 1644: York falls. Lord Ferdinando Fairfax appointed governor of the city. He saves the medieval glass from being destroyed by iconoclasts. There is a severe outbreak of plague in Leeds where one fifth of the population dies and Halifax (1625, 1630 and 1641). It also breaks out in York and Hull. The cloth trade comes to a standstill. Richard Tempest of Bolling Hall is forced to sell his estate to the Saviles but dies in debtors prison anyway. 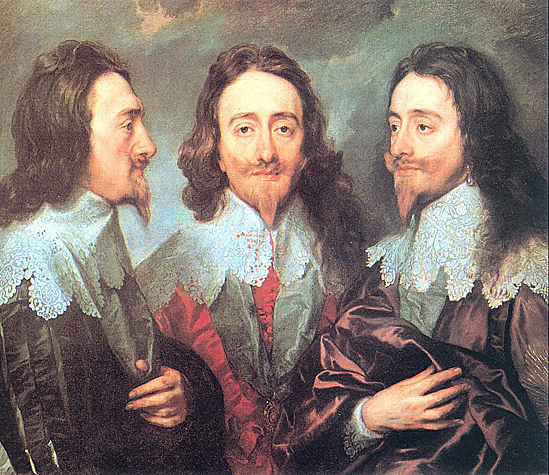 23 December 1648: The trial of Charles I is ordered. 20 January 1649: The trial of Charles I begins. 27 January 1649: Charles I is condemned. 30 January 1649: Charles I is executed. Halifax gibbet used for the last time. The Halifax gibbet was an early form of guillotine. James II deposed from throne. William and James’ daughter Mary invited to rule in his place.